My brother was about six years old when Dad gifted him with a Brahma heifer to call his very own. This cow was a bit spirited from surviving a tornado at a neighboring community. My brother had a patient calmness about him and gradually tamed this new addition to the farm. The cow became gentle enough to get a hug and eventually my brother put a cowboy hat on her head. She didn't flinch as long as he was there hugging her. 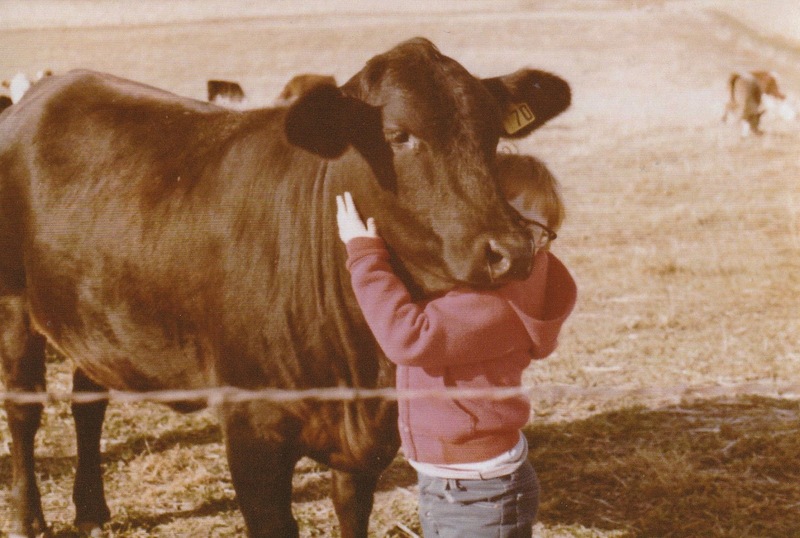 This first cow created a passion and love for animals and the farm for my brother. He felt so vivacious about farm work and learned so much. The fresh air and open spaces of the rural Midwest enticed my brother to yearn for adulthood on the farm. He was determined at a young age to grow his own herd, and he began by keeping the heifers his first cow birthed. At 45 years old, he has his own herd of cows, and every one of them is a descendant of the first cow he had at six years old. He makes this his business by feeding them, checking for births in the spring, and keeping track of each one. He writes his own charts that show the name, tag number, births, and features of each of the cows and calves. When I call my brother, he always announces what cows gave birth, who had twins, what color they were, and what the tag numbers were. Even the new calves my dad has are in the forefront of his memory. Yet, when he was born, my parents were told he was mentally retarded (I don't like that word, but that is what people called it then). There was a stereotype of a passive, empty-headed child who would barely be able to do anything. People knew very little about the abilities of those with Down syndrome, which are varying with each individual child. However, he found his niche in life despite the cultural stigma of long ago. My parents did lots to give him all the opportunities they could, but the small, rural farming community embraced my brother with love and acceptance because they were amazing good-hearted country folk. I can't say enough about the support and friendships of neighboring farmers and friends.